"Hey Dad, I need some advice on dealing with some trouble I'm in with the Transcendental Idealists." 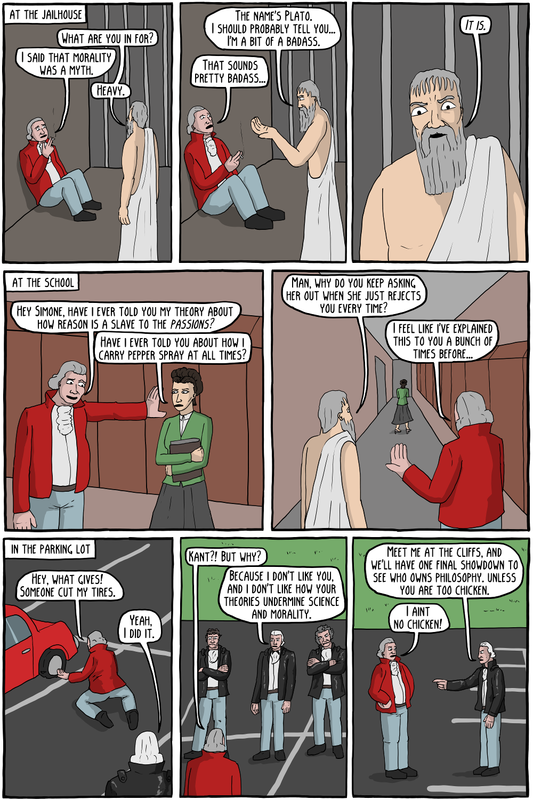 "Son, how many times have I told you not to hang around Transcendental Idealists? Why don't you hang out with that nice Empiricist boy from the church?" "Berkeley? He is such a loser!" One of David Hume's central skeptical ideas was that we could never observe causation directly. So, for example, when we see that a billiard ball hits another billiard ball causing it to move, we only see the two events occur next to each other (Hume called this "constant conjunction"), we don't actually observe any "causation". 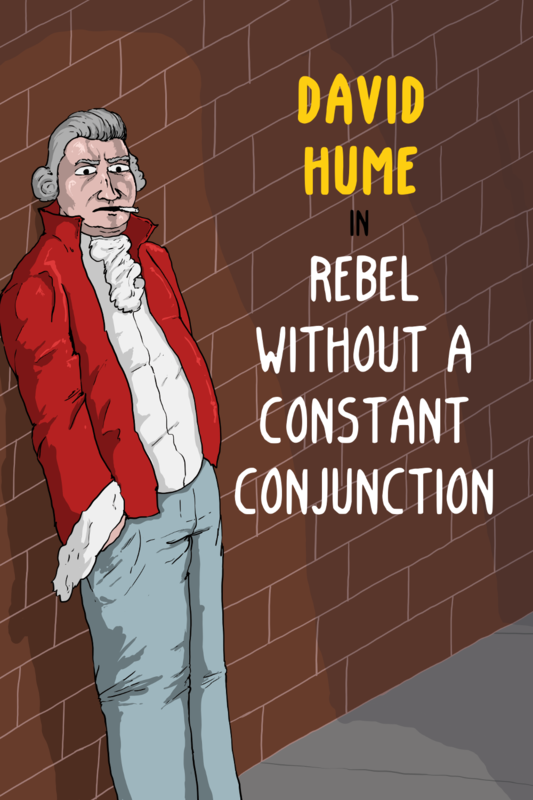 Hume was a strict empiricist, meaning that he thought all knowledge came from the senses, so this lead him to doubt that we could ever have any knowledge about causation, or know for certain if some event caused another event to occur. Kant famously said that reading Hume awoke him from his "dogmatic slumber". Largely in reaction to Hume's skepticism, he wrote The Critique of Pure Reason, which held that we could have synthetic a priori knowledge about certain things, such as causation. Synthetic a priori knowledge is knowledge that is about the world, but that is known from reason alone. So, while we usually know things about the world (synthetic knowledge) by observing the world (a posteriori), and we usually can only deduce logical facts (analytic knowledge) by making arguments from reason alone (a priori), Kant claimed that there were certain categories of knowledge that were structurally built in to our experience, that allowed us to know things about the world (such as that causation, time or space exists) from reason alone. This sort of system is called Transcendental Idealism, and it was extremely influential. 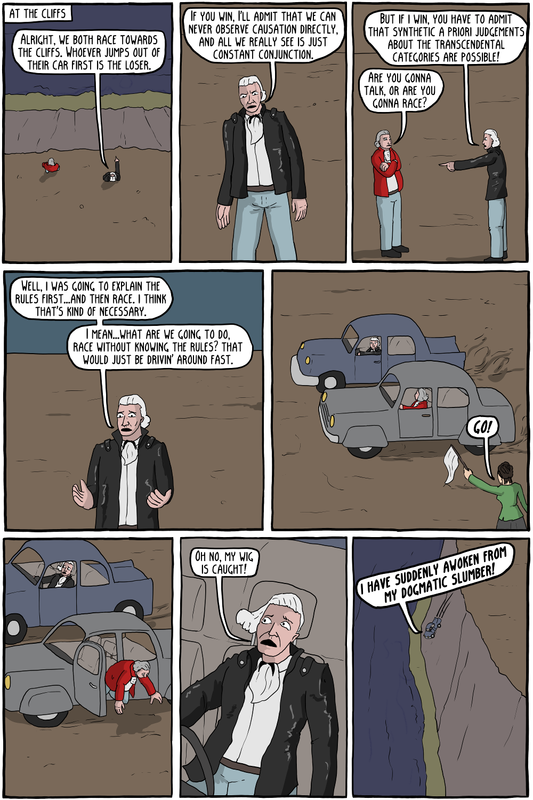 The other two transcendental idealists in his gang are Fichte and Schelling. Plato, all things considered, was pretty badass.